The interior colour selection is perhaps the most exciting and anticipated stage in pre-construction. Think of it as one massive shopping spree! We have half a day to pick doors, architraves, cornices, staircase, taps, wall and ceiling paint colour, bench tops, vanity cabinets, bathroom accessories, splashbacks…you name it. I have a fairly good idea of the style and look I want for our home. 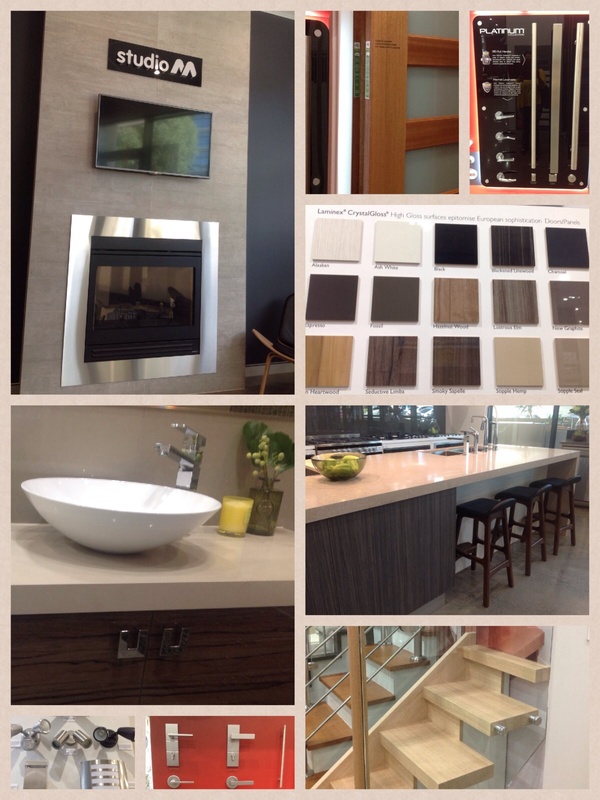 I love clean, sleek lines and white, neutral colours with wood accents. In Metricon’s book, my style is closest to Wall Street. I want the interiors to be simple, spacious, stylish yet functional and organised especially with three very active and messy children. I want our home to look beautiful but more importantly to work with our lifestyle. So, now that I’ve narrowed down the overall style it should be pretty easy to choose the colour and finishes right? Wrong! The myriad of choices is a wee bit overwhelming! I have a bad case of analysis-paralysis. Whilst the internet is a godsend for information at the fingertips, it’s also proving a great source of indecision. Can’t decide on the flooring colour. 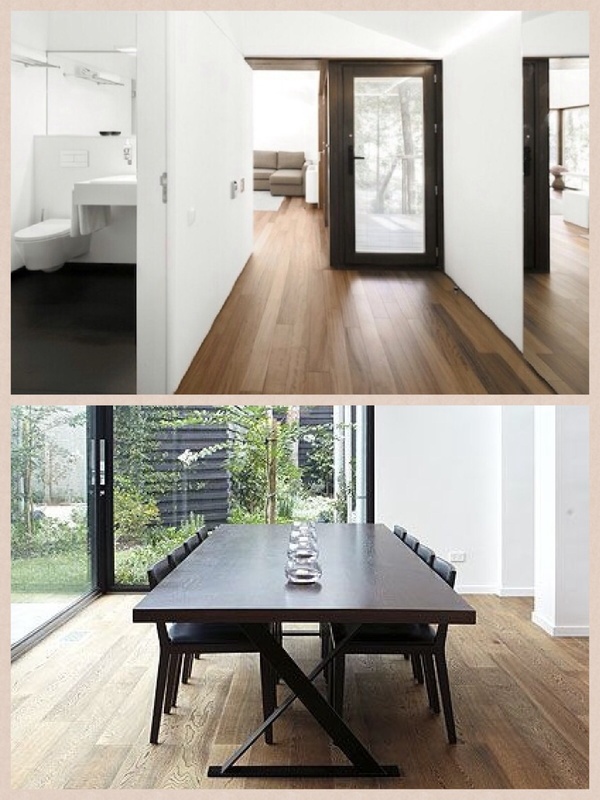 I love the contrast of dark timber floors and white walls but I’m also practical and hate cleaning. I’m worried how they will look when not clean. I think lighter coloured floorboards will be more forgiving and won’t show up the dirty footprints and smudges? What do you think? The colour scheme for the kitchen is also giving me pause partly because my husband has put his two cents in about his dislike for a white kitchen. He thinks white is too clinical and prefers a timber veneer look in oak or chestnut. I personally don’t dislike this look hence the dilemma. I think it may come down to the floor colour we end up with. 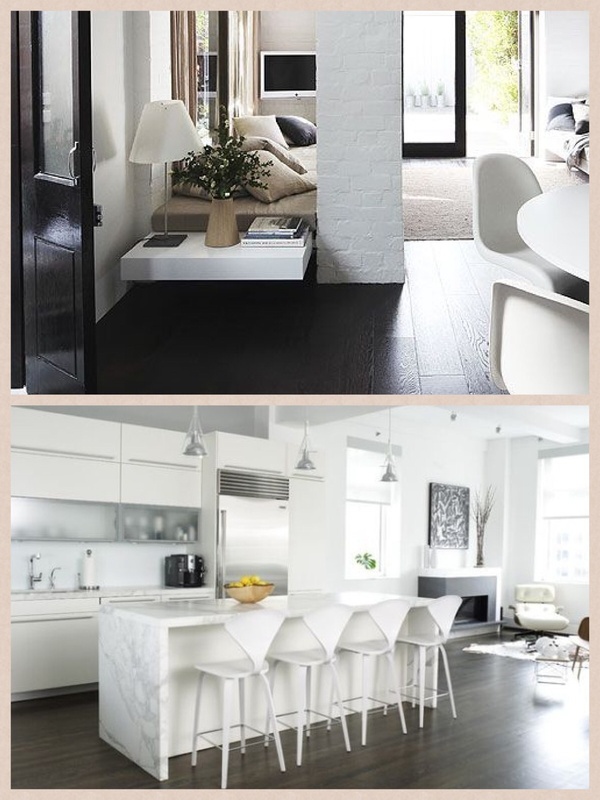 If we go dark floorboards, a white kitchen will look smashingly beautiful. I think this is one of those things that only you can decide. It’s really about personal taste. In my last place we installed recycled jarrah (dark, with some red to it). That really suits older style (vintage) homes. This time I want lighter and more modern so we are going for blackbutt. I’ve seen some woods with a black tinge – I think it somehow reflects an American style. And of course, there is plenty of lime-washed, white-looking timbers around now. I think that looks fabulous too but feel that it may be a passing fad. I don’t think you can go wrong with wood floors. They’ve looked good for decades. Mu husband has weighed in on the flooring dilemma. He also likes dark floors but thinks blackbutt or spotted gum is the way to go. I think the lighter floorboards will also match the rich walnut stain on the front door better than the dark wood. Are you having solid floorboards or floating engineered floors? Hello, just discovered your blog. We don’t have Metricon in WA, but the houses on their website look lovely. I know what you mean about the analysis paralysis! 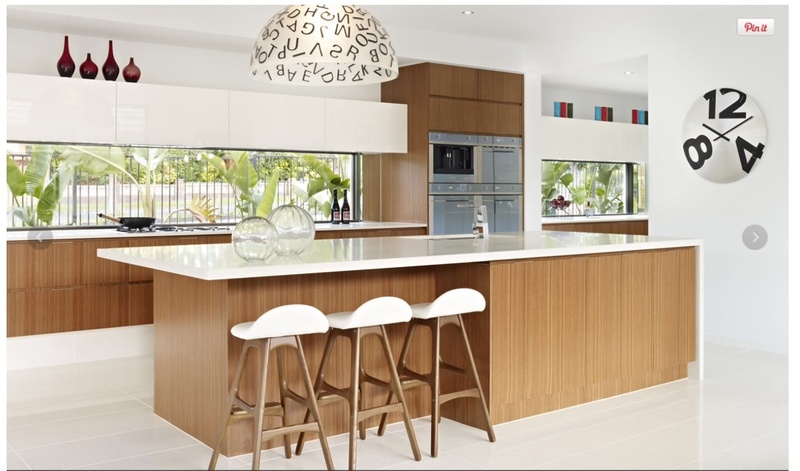 With dark floors, a white kitchen would be stunning, but lighter coloured floors are more flexible (spotted gum and blackbutt are both beautiful, modern-looking woods to be putting down). 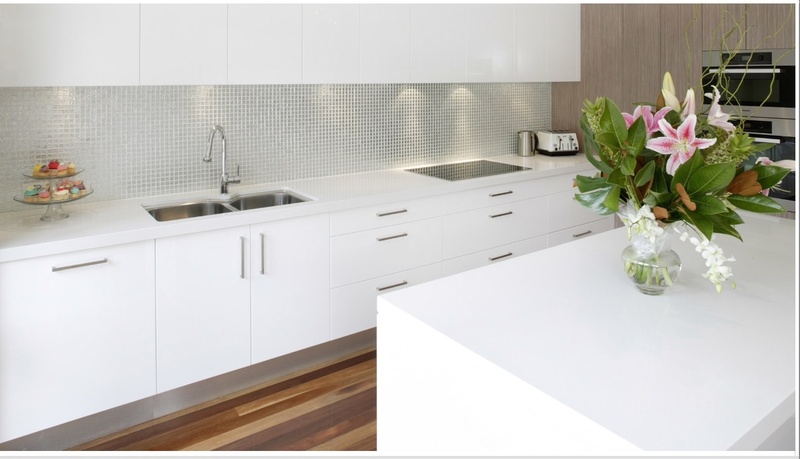 We will be having dark floors, but still not quite sure about the rest of the kitchen colours other than to probably have a light coloured benchtop. The jarrah that Johanne mentioned is gorgeous too, but I’ve found it really hard to decorate with. We’re building with Metricon too and are at a similar stage as your build. I’m also finding hard to choose the flooring. Still deciding between tiles and floating timber. Are you doing your timber floors through their supplier or are you installing them after handover? My dilemma with floating timber is that they’re installed after the kitchen has been installed, which means they will need to use beading around the waterfall edges of the kitchen island and around the skirting. I’m not entirely happy with this finish, as we’re thinking of upgrading benchtops. Looking forward to hearing about your internal selections! Hi Sydfam, thanks for stopping by:) It’s great to hear from a fellow Sydney Metricon client. Which design are you building? We have the laminate floor and carpet package in the contract but will be upgrading to engineered floating timber floors. I had an upgrade price estimate from M’s Carpet Call consultant but haven’t got around to getting quotes from external suppliers. But we probably will get M to install the floor as we want to get as much done prior to handover. I know what you mean by the beading around the island. I hate it but unless you’re putting in solid hardwood there’s no way around it. I’ve already asked many times if we can have the island installed after the floor and the reply from M has been a resounding NO:( Such a shame as I think it ruins the look of the island and the beautiful waterfall edge. Maybe tiles is the way to go? We’re building a modified Phoenix in the St George area and had our external appointment about 2 weeks ago. I have to say I am struggling with my internal colours and may need to seek assistance from an interior decorator. As for the flooring, we had timber floors in our last home and my husband is dead set against it in this house. With 3 kids I’m afraid he is right and we have to be practical and settle for tiles. I’ve changed my mind so many times, going from concrete look tiles, to stone look tiles and now to white tiles!! The white tiles we’re considering are used in the Greenhills Beach display. The issue I have with this tile is what to do with the alfresco tiles. How do I maintain the continuous flow to the outside with a white internal tile? The display has a sandstone type paver, which I’m afraid doesn’t match our externals. Have you decided on the timber species you’ll be using? The Phoenix seems to be very popular at the moment. One of the blogs I’m following is a Phoenix build in Adelaide. I must visit the display house soon. We’re also hiring an interior designer to help us with the internal colours. I think it’s a small fee to pay to get it right. I definitely don’t want to be re-doing anything if we get it wrong! We’re meeting the designer on Monday to do pre-selections. Hoping for an easy and enjoyable experience.